The Situation in Vishnive Before my "Aliyah"
I am a business owner. I have 4 employees and 2 apprentices. We are loaded with work. We get women clientele from all the surrounding areas, Jews and Gentiles. As I told you, we knew all the neighbors who lived the region. Our life among the Gentiles can be described as a two-way street - they are being fed by us and we are being fed by them. Leibl got Ulcers. In those days this was a very bad disease. He needs expensive medicines, and sometimes hospitalizations in a clinic in Vilna. All my savings and my sister Rivka's savings are spent on his medical expenses. My brother Yaacov-Hirsh is helping too. Leibl himself, when he is not in pain, is working and earning a bit. He actually got married at age 36 through a matchmaker. However after awhile his sickness became more severe and he returned home. His wife could not handle the disease. My Mother is not well either. She is already old. She gets moral and financial support from the children who live in her home. These are Leibl, Rivka and me. My sister Rachel-Lea is married and living in Ivenitz raising her own family. Gitke is in the kibbutz - "Hachshara" in Lida. 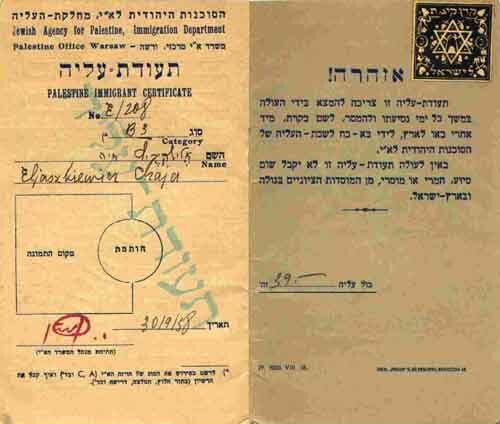 The activities in "Hechalutz" and "Hashomer Hatzair" became weaker because of the great difficulties in getting "Certificates" (immigration visas) from the British to Palestine. Many young Zionists, still dreaming about "Aliyah", have to settle down instead. Some young people, including two of my best friends, Rivka Rogovin and Esther Lichterman, are already in Eretz Israel. They write upbeat letters about their exciting new lives. My heart is exploding with envy. The Polish government is killing us with high taxation. Jews are their favorite targets. I have already been in my profession for eight years. Although I earn money, the expenses in my family are great. I have two older sisters who are not settled yet. Consequently my dowry is small. I can not afford "Aliyah" because it is very expensive. My dream seems to be unattainable. One day in the Winter of 1937 Rashel Rogovin came to see me. I was preparing a dress for fitting and giving instructions to the girls. Rashel asked to talk with me in private in another room. There she said, "I have been fond of you for many years. I think you are a wonderful, talented woman, and have been very good friend of my daughter Rivka. I have always loved when you visited us since your early childhood. You have known our family and we have known you. We want you as a bride for Mordechai. We think that you will be a very good wife for him and an excellent daughter for us."…. Then she added, "You know that Gershon has been in Eretz Israel since 1926. He already has a family. He married Tova and is well settled. I have already a granddaughter from him, Rochele. Here are the pictures…..Their economical condition is good." ….."I do not have to tell you that Chaia-Rivka has been working in Meshek Hapo'a lot in Hadera for the last two years, since 1935. You are very good friends. Mordechai is an excellent, devoted, faithful and caring man. He has been there since 1932. He has been working and earning his living. Both of you will work and build a very fine family. You will not arrive there as a stranger. You will have a family that will take care of you and allow you to settle down. Our family is very devoted and we take care of each other. Mordechai has been living at Gershon's house, saving as much money as he can." ……So she said. Finally she added, "Rivka is very successful in her work and in her social life. She is very well connected. She can get you a "Certificate". She wrote to me that there is an excellent opportunity to get it. A Dutch girl changed her mind about coming to Meshek Hapo'a lot. It was too difficult for her to leave her parents. Rivka can get the "Certificate" for you. You have the opportunity both to make "Aliyah" to Eretz Israel and marry my son, Mordechai." She finished talking. My heart was pounding wildly. I returned to the work room where the girls were working enthusiastically. I resumed my work, but I could not stop thinking about Rashel's words. What an opportunity! It is true that I had not known Mordechai that well. But I recalled him working in their store and helping support the family. I remembered him as a quiet, pleasant and easy going person. I have a golden opportunity to fulfil my "Aliyah" dream, and in addition to build a family of my own. I know this family. It is a very good, cohesive family. The mother is very smart and the father is quiet and gentle. In the past, even before she thought I would be her daughter-in-law, I heard stories from Rashel about the Rogovin and Levin families. Levin was Rashel's maiden name. When you enter their home, you always find a reading book and a newspaper, and you feel serious, pleasant atmosphere. The brothers were very close to each other. Shlomo, the oldest brother from Vileika, was very handsome and well to do economically. He was very attached to his family and supplemented all their needs. He even took care of the two younger brothers Hirshe and Ayzik by bringing them into the timber business. On the other hand, how can I leave my beloved family to which I contribute? How can I leave Leibl, my sick brother, who gave everything to the family during the difficult times when my father died? What about my ailing old Mother? What about my brother Yaacov-Hirsh who was the great Zionist - should he stay while I leave? I was very closely attached to him, Teibl and their children Avraham-Binyamin and Chaimke. I could not relax. The girls noticed that something was bothering me, but I said nothing. At the end of the day I went to my brother and told him about my conversation with Rashke Rogovin. I asked, "What do you think?" It was important for me to know his opinion. I regarded him very highly, as did the whole shtetl. My brother told me, "Go! Do not miss this opportunity. Mordechai is a good guy. We know the family. They are very close and you won't be alone. All your life you dreamt about Eretz Israel. Go! You will be the first and we will follow you." Then he added, "At a certain point a person has to take care of herself. Do not worry. We will find our way, and with God's will, soon we will all be in Eretz Israel".